A politician belonging to the Indian National Congress, Virbhadra Singh is the former Chief Minister of Himachal Pradesh. In April 1983, he became the Chief Minister of Himachal Pradesh for the first time. He is known for shifting his constituency ahead of polls. 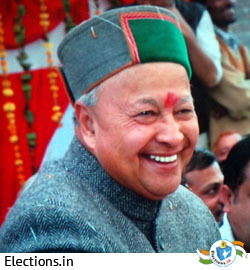 Earlier, Virbhadra Singh had contested election from Jubbal and Kotkhai, Rohroo, and then Shimla Rural constituency. The longest serving chief minister of Himachal Pradesh, Virbhadra Singh was born on 23 June 1934 at Sarahan, Shimla district in Himachal Pradesh. He is a graduate from St. Stephens College, University of Delhi. Virbhadra Singh holds a Bachelor of Arts degree. His family includes his wife- Pratibha Singh, a son and four daughters. Virbhadra Singh has done his schooling from Bishop Cotton School, Shimla. Virbhadra Singh has contributed significantly not to national politics but state politics as well. In the Indian General Elections of 1962, Virbhadra Singh won a seat in the Lok Sabha. He again won in the election of 1967 and 1971. However, in 1983 he became the chief minister of Himachal Pradesh for the first time and won his seat from the Jubbal-Kotkhai constituency. Virbhadra Singh is the longest serving chief minister of Himachal Pradesh. Consequently, he was appointed again as the chief minister in 1993, 2003, and then in 2012. In November 2012 elections, Virbhadra Singh was appointed to lead the Congress Party in the state which he did successfully. From February 1992 to September 1994, he was the President of the Himachal Pradesh Congress Committee. In 1976, Virbhadra Singh was a member of the Indian Delegation to the General Assembly of the United Nations (UN). In 2017 assembly elections, his party was defeated.